This is a PG rated blog, so I’ll let you as the reader figure out what Wednesday Thursday Friday means. Look closely at the contents of this bin. Or as I did, glance at it as you drive past. What is this guy thinking? Does he really think that the water bottle packaging is recyclable? Also, I too wish that we could recycle paperboard, but that is not something that is currently accepted in the blue bin. Finally, we see one of my huge pet peeves – caps left on plastic bottles that are to be recycled. These caps are made out of a different material than the bottles and can not be recycled. Please remove them before throwing them in the bin. Even better – use your own glass or reusable bottle and drink filtered tap water! For reasons why bottled water is a problem, watch this video: http://www.youtube.com/storyofstuffproject#p/a/u/0/Se12y9hSOM0. Ever wonder what happens to what you recycle? Check out this video from WAAY 31: http://www.waaytv.com/global/Category.asp?c=181929. 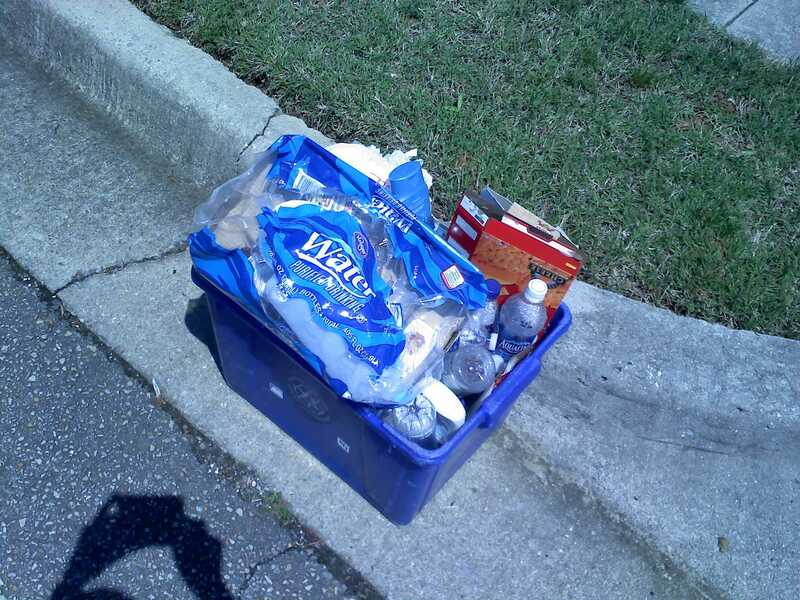 How do I get a blue recycling bin?Huntsville City residents: please call 256-830-BINS (2467). Madison County and all others who live outside Huntsville: please call 256-532-1513. Where can I recycle glass? 1004 A Cleaner Way, Huntsville, ALPermanent, specially marked dumpsters are accessible 24 hours a day. For more information, call 256-830-2467. Thanks Again! 🙂 I am one of those annoying people who leave my caps on my recycled bottles (when I use them). It never occured to me. Thanks for pointing that out. My bin will definately be containing less plastic bottles now that I switched to tap. I also wondered what it was I could be putting in my recycle container besides magazines, cans and bottles. Now I know. You’re welcome, Jodi! Glad I could provide some useful information!